Outlook - Morse Asset Management, Inc.Morse Asset Management, Inc. The market’s backdrop continues to reflect strong corporate and economic data. Monetary and fiscal policy is of concern but the weight of evidence continues to be positive. We remain optimistic for the U.S. markets in 2019 and believe that our patient focus on fundamentals and discipline will be rewarded. Market volatility during the fourth quarter, while painful, was unavoidable and primarily superficial. The news cycle became obsessed with interpreting and overemphasizing comments from the Federal Reserve and tweets by government officials. Speculations, not facts or clear intentions, drove an emotional and to an extent irrational selloff. Corrections happen periodically and are ultimately healthy for the market. It is important to remember that not all corrections lead to a recession; they can happen quickly and often for irrational reasons. Trying to time corrections is a fool’s errand but does create opportunities. We did not see enough change in relevant fundamentals to warrant drastic action. We made minor adjustments but otherwise remained invested in our portfolio of high-quality companies with bright prospects. 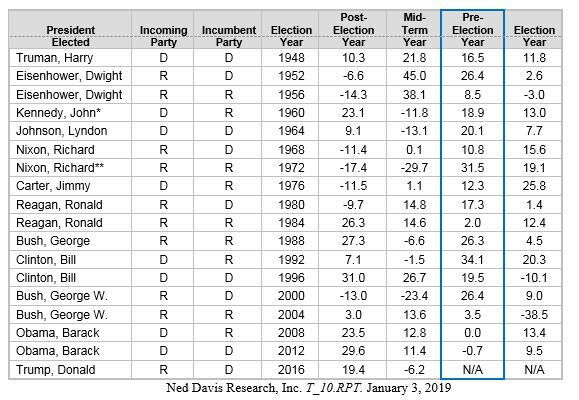 Historically, the 3rd year of the four-year U.S. presidential term cycle, also known as pre-election, has been the strongest for markets, as the government has stimulated the economy following midterm elections. Since the end of World War II, the S&P 500 performance during the 3rd year of the cycle has been positive 88.2% of the time with an average gain of over +17%, noted on the first attached chart. 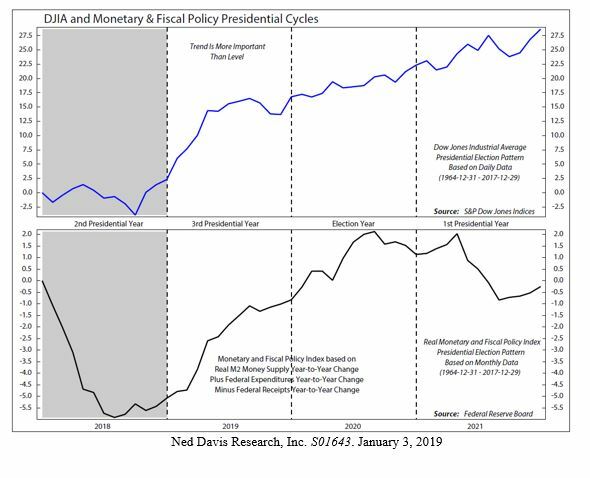 The second chart is a composite average of annual data since 1964 that shows a linkage between the seasonality of the stock market (top) and monetary policy and fiscal stimulus (bottom) during the four-year presidential cycle. This should not be viewed as predictive, but the historical tendencies of the market can often provide useful perspective when combined with fundamental data points. As we have commented in the past, monetary and fiscal policy can either enhance or constrain economic growth. On the monetary side, the Federal Reserve’s “normalization” of its balance sheet and interest rates certainly has the potential to constrain the economy. However, it has been clearly stated that the current path is data dependent and the Fed is open to pause or reverse if necessary. Since the 2016 elections, fiscal policy has been very supportive: tax cuts, offshore repatriation, reduced regulation and increased spending. Congress is now split so further material progress is unlikely. This leaves trade negotiations as the most important tool in the year ahead because trade barriers and tariffs act like a tax in the way they impact demand. Both China and the U.S. stand to gain in resolving the trade dispute and progress is being made. When a deal is finally complete, we expect the markets will get a substantial lift. U.S. equity earnings and revenue continue to be strong, but the pace of growth is expected to moderate in 2019. According to Factset’s Earnings Insight on January 18th, the S&P 500 blended earnings growth rate for Q4 2018 is +10.6%. As a result of last week’s correction, S&P 500 forward 12-month P/E ratio is now down to 15.3, below the 5-year average of 16.4. The current bottom-up price target for the S&P 500 over the next 12 months is +15% above yesterday’s close.